Governor Terry Branstad invited seven local government officials to his weekly news conference to help pressure legislators to embrace Branstad’s plan to cut commercial property taxes. “We think it’s important that this session not adjourn without providing property tax relief. This has been a priority of mine since I ran for governor,” Branstad said. The Iowa League of Cities, which represents nearly 900 Iowa cities and towns, is opposed to the governor’s latest plan. 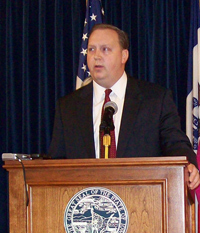 The Iowa State Association of Counties had been “undecided” on this year’s proposal, but formally registered “against” it last week. According to Dallas County Recorder Chad Airhart, that’s a mistake. 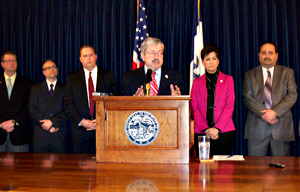 County leaders joined Governor Branstad at his weekly meeting with the media. “Instead of digging in and entrenching their position, the governor and lieutenant governor have offered an olive branch,” Airhart said. Airhart and the other six local government officials who stood with Branstad this morning are fellow Republicans. AUDIO of Branstad’s 28-minute news conference. Branstad’s revised plan calls for reducing commercial property taxes by 20 percent within five years, with the state sending counties and cities hundreds of millions in state taxes to make up for that lost revenue. Branstad’s plan also calls for limiting increases in residential property and farmland to two percent a year. The governor faults the tax credit idea advanced by Democrats because the credit is only for commercial property tax payers and does not address property taxes paid by home owners or those who own farmland.